The following surnames are on this page: Adam, Adams, Birkbeck, Blackstone, Bohy, Cavendish, Duncan, Estabrook, Freeman, Hiester, Holmes, Jenkinson, Striebich, Wheeler & Warren, and Whitmore. Blue indicates softcover editions may be available. “Our greatest responsibility is to be good ancestors.” - Jonas Salk 1914-1995. Welcome to Bookshelf 1 at Hawkeyes Trading Post! 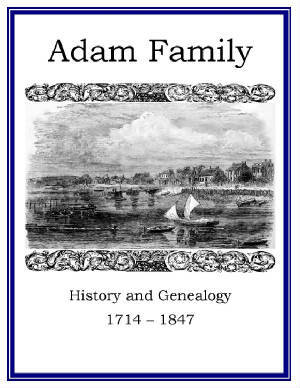 Adam Family History and Genealogy PDF eBook English 1.55 MB 1848. John Adam sailed from Scotland May 6, 1737 to the American Colonies. There are 4 generations of his descendants documented in these pages published prior to the American Civil War. Although the publication is only 14 pages in length, there are 4 generations of essential dates and names ranging from 1714 to 1847. This is a rare treasure of early Adam family genealogy! Price $6.95 USD. 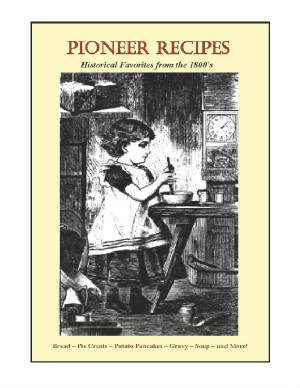 Pioneer Recipes - Historical Favorites from the 1800's. PDF eBook English 12.5 MB. 1988. Put this on your laptop for your kitchen use! 5 Star "perfect pie crusts"! Just add the filling. These recipes have been handed down for many generations! They are really exceptional! Homemade bread recipes, both white and whole wheat, will put a smile on everyones face! Seriously, these bread recipes could win awards! Can you smell that great aroma of fresh bread baking in your own oven? These are THE recipes you need! Start your own weekend tradition of baking bread in the afternoon! Your kids or grandkids can help! It's worth every penny! Price $5.95 Now $3.95 USD. Order Now Your PDF version! 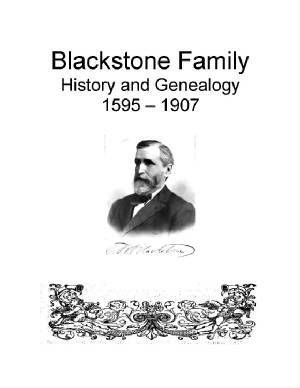 Blackstone Family History and Genealogy or Lineage and History of William Blackstone. PDF eBook English 6.78 MB. 1907. The descendants of William Blackstone are documented in this eBook with genealogy that spans a period of 312 years, from the year 1595 to 1907. There are five generations, short biographies, with hundreds of descendants and in-laws listed! A great genealogy resource! Price $6.95 USD. 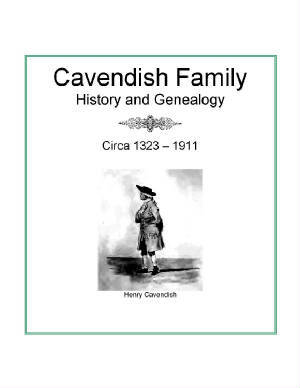 Cavendish Family History and Genealogy or The Cavendish Family. PDF eBook English 18.3 MB. 1911. The eBook not only includes genealogy for American descendants, but also enchanting family legends over 600 years old! Including how Judge Cavendish bought the manor of Cavendish held by the family of Odyngseles in 1359. According to another legend, Roger Gernon, who died about 1323, married the heiress of John Potton, Lord of Cavendish in Suffolk; the eldest of his four sons, who all took the name of Cavendish, being Sir John the Judge. An great resource for Cavendish family members! Price $6.95 USD. 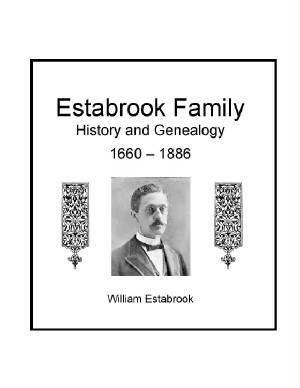 Estabrook Family History and Genealogy or Genealogy of the Estabrook Family. PDF eBook English 8.54 MB 1891. The Estabrook family legend dating back to 1413 is discussed in this eBook. Genealogies from Joseph, Thomas, John, Elijah, and Isaac with descendants extending to the 5th generation, which date from about 1660 to 1886! Astonishing index references nearly a thousand relations! Price $6.95 USD. Hiester Family History and Genealogy or A Genealogy of the Hiester Family. PDF eBook English 1.37 MB. 1903. Here is found the Hiester family legend to the Silesian Knight, Premiscloros Husterniz, in the year 1329. Astonishing! 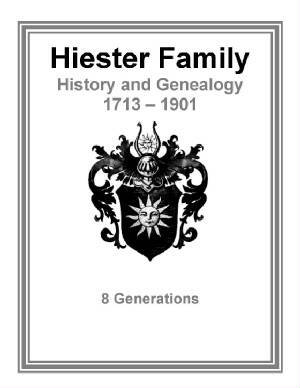 Documentation of Hiester descendants is compiled for the years 1713 up to 1901, which provides 8 generations of the family lineage! This eBook is a real treasure for any member of the Hiester family! Price $6.95 USD. 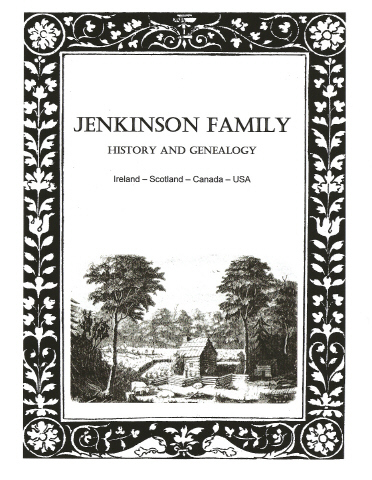 Jenkinson Family History and Genealogy. PDF eBook English 17.0 MB. 2000. George Jenkinson was born about 1826 in Ireland, and died March 4, 1904 in Arcadia Township, Lapeer County, Michigan. He was an Irish Orangeman and proud of it! He and his brother Thomas immigrated to Aberdeen, Scotland when they were teenagers to work the granite mines. There he married Elizabeth Love. The group immigrated to Canada in 1852, and eventually settled in Michigan. Numerous pictures included, and historical family documents prior to 1900. This eBook covers a period of 180 years with 8 generations! Price $9.95 USD. 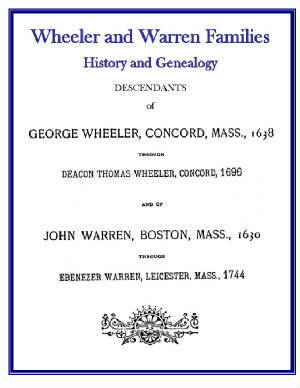 Wheeler and Warren Families History and Genealogy. PDF eBook English 7.10 MB Year 1892. 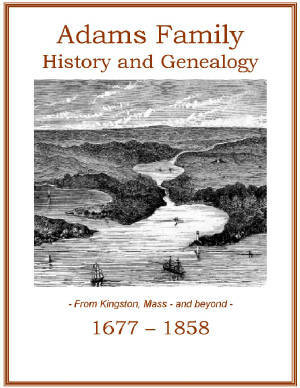 The accomplishments of both the Wheeler and Warren families are provided in this detailed publication that spans the centuries from 1638 up to 1889. There are rare ancestral photographs of Warren kindred, and a 7 page index containing over 300 descendants of the Wheelers and Warrens. If you can trace your genealogy back to around 1885 you may be able to utilize documentation in this eBook to extend it back another 250 years! A wonderful resource for the Wheeler and Warren genealogist! Price $6.95 USD. 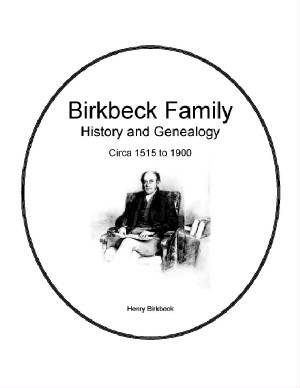 Birkbeck Family History and Genealogy or The Birkbecks of Westmorland and their descendants. PDF eBook English 93.1 KB. 1900. This eBook includes the legend that “the Coat of Arms were granted to Thomas Birkbeck of Carlisle in the seventh year of Henry VIII" ( 1515 A.D.), it is said: “for his brave defense against the Scots”.” Many rare family photographs! The family Coat of Arms are contained in this rare publication that is a wonderful reference for the Birkbeck genealogist! Price $6.95 USD. Bohy Family History and Genealogy. PDF eBook English 6.65 MB. 2005. John Baptist Bohy was born in Brussels, Belgium on August 8th of 1850. He immigrated to the United States aboard the vessel Labrador on September 14th of 1881, and joined the coal mining community at Hawk Run, Pennsylvania. There he met Ida Dieu, and married. The Dieu genealogy also goes back to Belgium and France. Known descendants, and members of related families, which include Bohr, Dieu, Duprey, Hockridge, Koch, Rostucher and Scheele are listed! This genealogy spans 150 years! Many rare family photographs included! Price $9.95 USD. 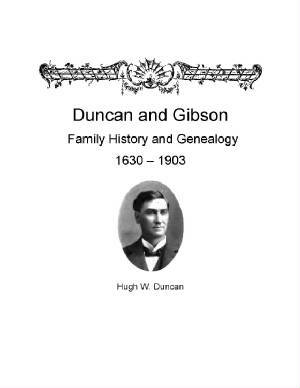 Duncan and Gibson Family History and Genealogy or The Duncan and Gibson Families. PDF eBook English 1.80 MB 1905. 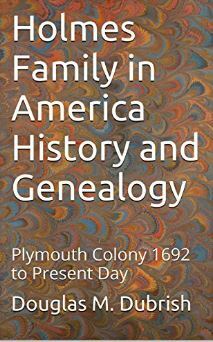 The eBook discusses the legend of the family name dating back to 1040 A.D. with many references to family members in the 1400’s. Short biographies of descendants listed range from the period 1630 to 1903! Over 270 years! Also includes short biographies of in-laws in the Andrews, Coe, and Smith families. A wonderful reference for the family genealogist! Price $6.95 USD. Freeman Family History and Genealogy or History of the Freeman Family. PDF eBook English 3.43 MB. 1914. Genealogy of the descendants of Hezekiah and Abigail Freeman with earliest reference about the year 1750, and detail on descendants up to the year 1911. This genealogy has six generations listed with numerous rare photographs. However, the photographs were beginning to fade due to deterioration occurring on the original printing... which is nearly a century old. 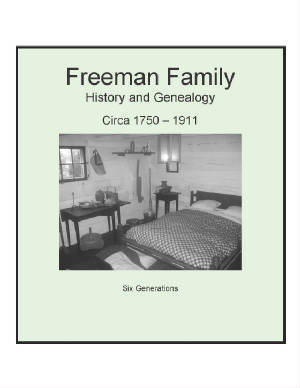 A valuable resource of information for anyone interested in Freeman family genealogy!Price $6.95 USD. Holmes Family in America. PDF eBook English 11.8 MB. 2006. This eBook contains the amazing family legend of three Holmes brothers who left England and came to the New World. One settled on Manhattan Island, one in the Massachusetts Bay Colony, and the third in the Connecticut Colony. Nathaniel Holmes was born August 30, 1692 in Plimouth, Plimouth County, Massachusetts, and this eBook contains his genealogy. 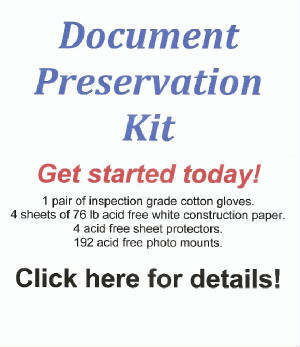 There are 9 generations, unique ancestral photographs, historical documents, and a well referenced genealogy. Essential dates for descendants begin in 1692. 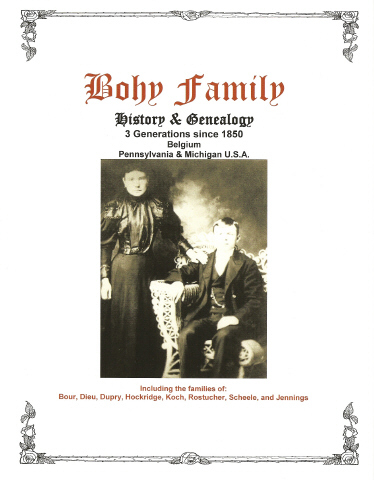 An excellent resource for Holmes family genealogists! Price $9.95 USD. 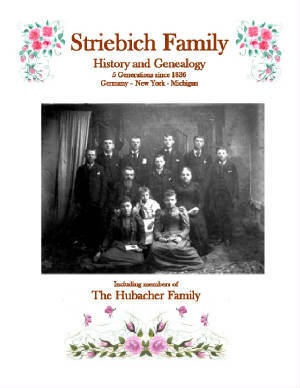 Striebich Family History and Genealogy. PDF eBook English 14.1 MB. 2004. Born in Baden, Germany on April 19th of 1836, Anthony Striebich immigrated with his family to the United States at the age of 7. At 23, he renounced his allegiance to the Duke of Baden Germany and became a citizen of the United States. He joined the Union Army during the American Civil War on January 18th of 1862, and marched with the notorious General Sherman! After the war he moved from Buffalo, New York to Cheboygan, Michigan. Many unique family documents, letters, references, and rare family photographs from the 1800’s. Also includes members of the Hubacher Family before 1900. A great reference for anyone interested in Striebich family genealogy! Price $9.95 USD. 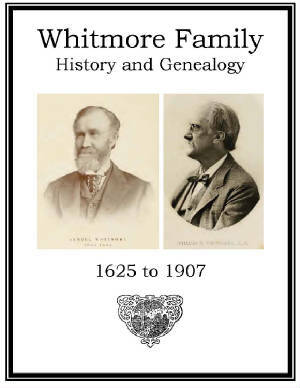 Whitmore Family History and Genealogy or A Record of the Descendents of Francis Whitmore 1625-1685. PDF eBook English 6.48 MB 1907. Here is described the remarkable family legend that the name is derived from around the year 1215, by the Gothic words Wid (spear) and Mor (famous). WidMor, which means famous with the spear! An excellent history that includes 9 generations, and spans 282 years from 1625 up to 1907. There is a 7 page index containing over 700 descendants and allied family members! A real treasure for any family genealogist in the Whitmore family! Price $6.95 USD.